This one is from 2015 actually, but wasn't shared publicly before. 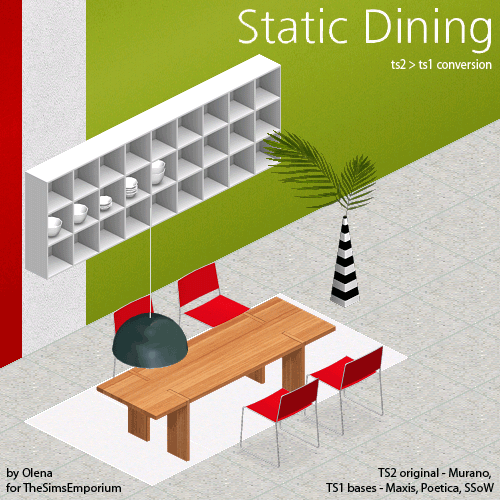 Table, chair, ceiling lamp, wall shelf and floor tile. Plant is from one of my earlier sets here – Modern Collection #1. Walls are yet to be released at some point. Birthday-2016 gift to my beloved Genie @ N99. You may request it in THIS thread. The sideboard is pre-cluttered and thus is deco only. 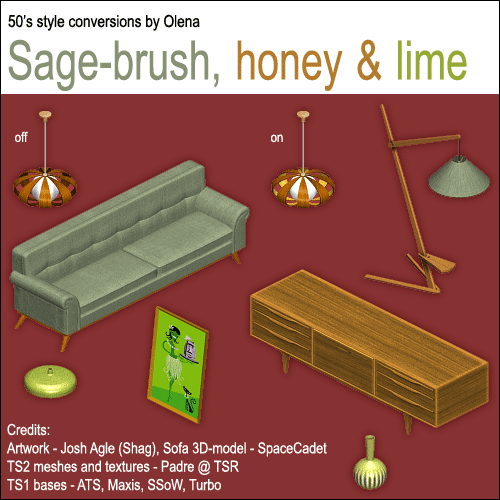 My lovely affiliate Watersim wanted a 50's sofa, so I did one plus some more objects to go with it. Find it among Downloads on her SITE. This is a gift to my wonderful friend and Muse – Nyx for her Birthday-2016. It’s available on her second site – TheSimsEmporium under a gifts section. One more thing, not available for wide public before. Just a single vase, made on friend's request. A gift to adorable JustDenise, who is a fan of "Sherlock" series as well. 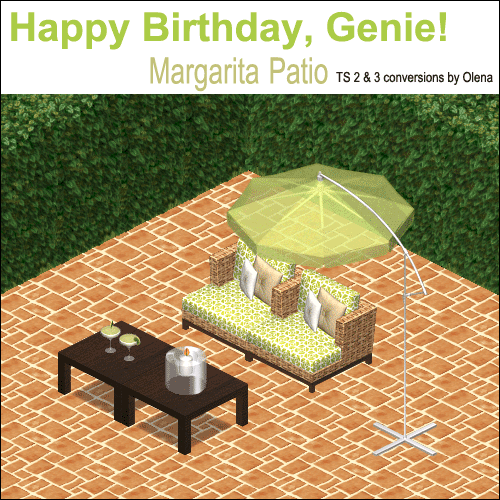 She kindly shared this gift on TerraLuna Sims 1 forum. To get it you have to register if you're not a member already. Available in THIS thread. Functional stereo (backless, as it's meant to hang on wall) and deco speaker. 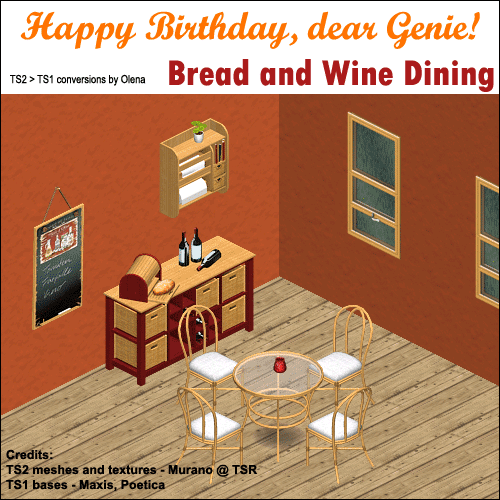 This year's gift for Genie's Birthday. Available for request in THIS thread at N99 forum. Candle is a permanently lit lamp actually (not animated). 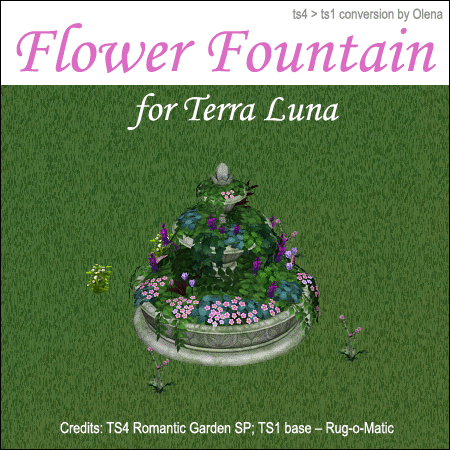 This is a gift for TerraLuna forum members and thus available only THERE. Not an actual fountain, but a rug-based deco flowerbed. And latest so far – participation entry for Creator's Challenge #1 at TerraLuna. This is my first ever completely finished window and despite all flaws I'm very proud of it. Get it in THIS thread. 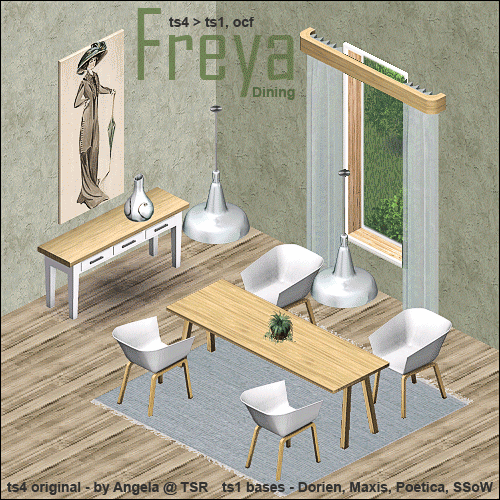 My heartfelt thanks to Angela @ TSR for generous permission to convert her lovely objects to Sims 1. What's included: chair, curtains, lamp, painting, rug, table, sideboard and vase. 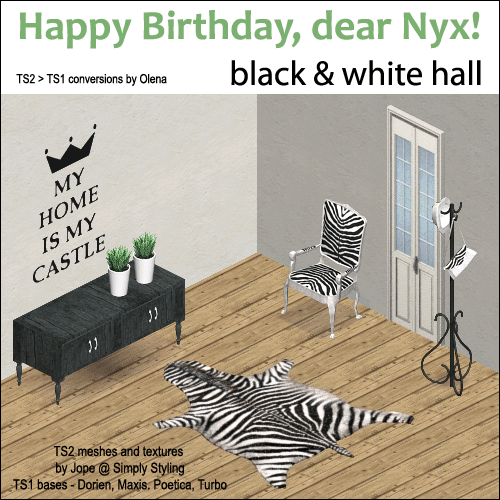 Not included: plants (from the game), floor by Nyx, wall by NanaWildflowers, window by Gookabee (closed). First and foremost - functional phone! Needs "Hot Date" EP. Unpack object and skin files to any sub-folder in your Downloads. Also functional iPod in a dock - as usual goes anywhere from floor to shelves and have all music stations included, so may require House Party & Vacation EPs. 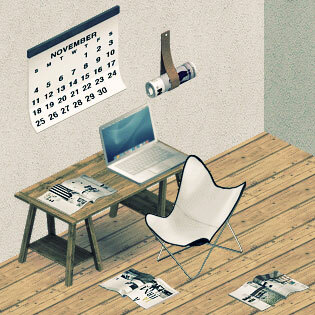 All the rest - baskets, hair dryer and pinboard are just deco. Phew! 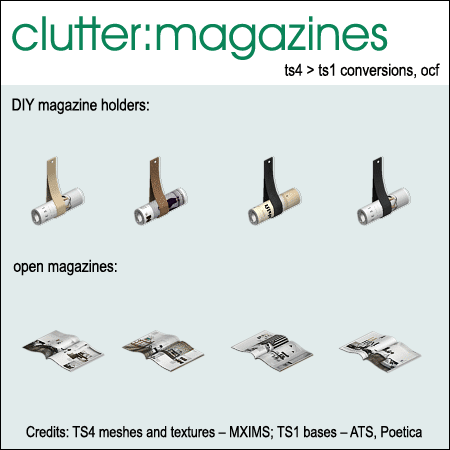 Finally, I moved all Clutter Factory pics from PB to another service. 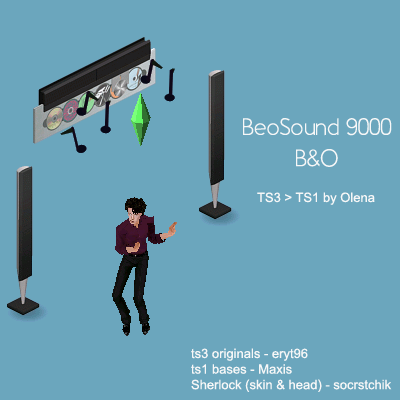 Also added download links for all my files previously available only at CTO (look under "gifts by me" tag). Enjoy! Still have to fix pictures on Nocturnal Market and some broken DL links on both sites. Due latest Photobucket's policy change all my pics aren't showing anymore and I'm slowly moving them to another photohosting service. This will take some time. So, please, bear with me, while I'm trying to fix this. Sorry, guys, for not updating in almost a year, but RL keeps me busy and away from Sims most of the time. 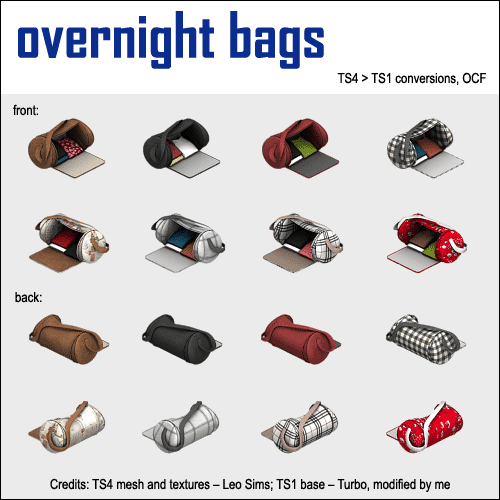 Just an overnight bag in 8 colors. Not deco-only this time - it is a fully-functional dresser, which can be placed anywhere. 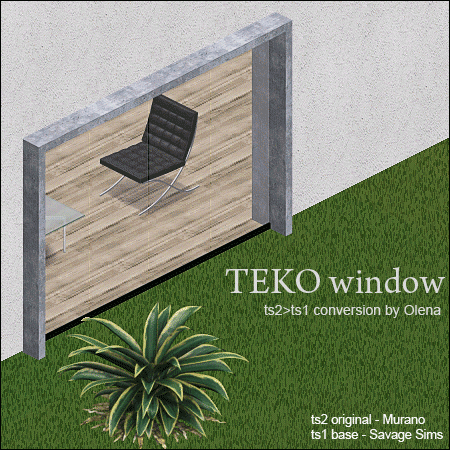 It's a conversion from TS4 object by Leo Sims.